Added a show/hide console option. Added an SFX when selecting characters. Added ambient sounds near the water. Now bosses get tired after following the player for a while. Buffed speed reduction of gorilla growl. Fixed "Cooldown goes slower on less fps". Removed HP regen except while sleeping. Fixed a graphics error on bandits. Fixed going to the menu while mounted. Fixed houses and building spawning underwater. Fixed jumping on low framerates. Fixed getting damaged while jumping. Fixed memory leaks when creating multiple worlds. Fixed the camera after opening the map while mounting. Fixed opening map when on a horse. Fixed skill cooldowns take longer on lower framerate. Fixed spawning structures sometimes would be under the ground. Fixed SFX not looping correctly. Fixed a bug where skills would be shared between classes. Fixed a bug where structure models wouldnt appear but collision and particles would. Fixed a bug where the walking SFX would play in the water. Fixed a bug where you wouldnt be able to roll in certain situations. Fixed bug were player wasnt able to load a game with a dead character. Fixed character angle when on loading screen. Fixed game not playing the human walking animation. Fixed getting damaged when respawning. Fixed locking the framerate does strange things. Fixed mobs making walking sound on water. Fixed some sound effects (like the horse running) not adapting to the game's volume. Fixed structures models spawning underground. Fixed taking a screenshot has a black band. Fixed textfield not working in fullscreen mode. Fixed the height of the health bar in humanoids. Fixed water being overly transparent on the map. Fixed "When you charge up the 3 arrow shot with RMB the charging sound keeps playing like every 2 seconds". 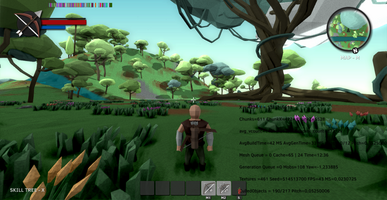 Improved physics response on lower framerate. 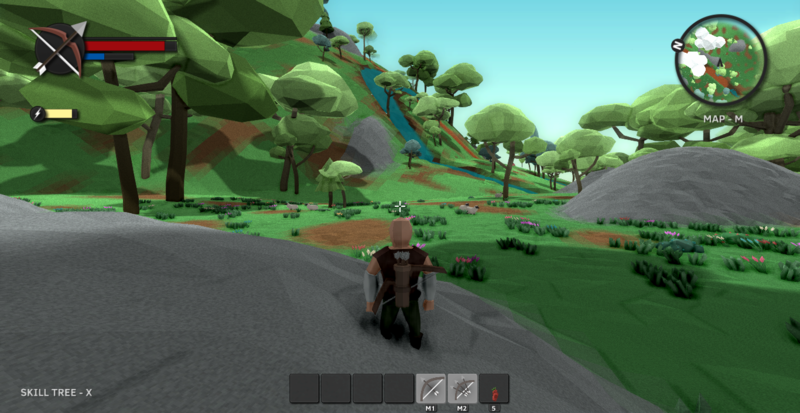 Improved chunk LOD color borders. Improved wrong culling of chunks. Normalized the volume of all the sound effects. Now you can have up to 4 characters. The travelling merchant now sells the boat.